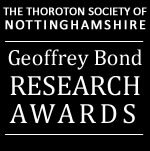 Once again, this year we received a number of very good and worthwhile applications for research awards from the generous amount provided by Geoffrey Bond and by an equal amount from Thoroton funds. The selection panel, chaired by John Beckett, decided that this year awards would be made to three applicants. Bassetlaw Christian Heritage has been awarded £1000 to continue its project to research and document material of all kinds relating to local dissidents which may be held in archives, local churches or orally. This is being undertaken in the lead up to the 2020 commemorative year which will mark the 400th anniversary of the Mayflower Pilgrims’ voyage to America in 1620. As you will be aware, many of the leaders of the Mayflower Pilgrims came from villages in the Bassetlaw area. A project to be undertaken by archaeologist Tom Keyworth has been awarded the sum of £635. This will comprise an investigation at Lodge Farm, Burton Joyce, involving an auguring survey of the ditchfill at the site and further environmental examination and recording of the organic samples. Research by Jenny Sissons on the county’s mediaeval monastic sites has been awarded the sum of £350. There is a requirement for those receiving grants to provide articles on the outcomes of their research for the newsletter and, subject to editorial processes, there may be future articles in the Transactions. We are grateful for Geoffrey Bond’s support in enabling such worthwhile research to be undertaken relating to our county and we look forward to next year’s applications which will be due on 1st September 2019. 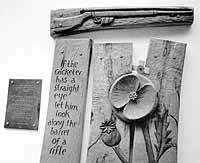 On 4th September a new First World War memorial was unveiled on the Pavilion at Trent Bridge Cricket Ground. It is fixed to the right of the steps and consists of three sturdy English oak carved planks surmounted by one very large poppy and its leaves. Above it is a carved wooden rifle. To the left it states, ‘If the cricketer has a straight eye let him look down the barrel of a rifle’ (Sir Arthur Conan Doyle). Adjacent, to the left, is a small slate plaque bearing the names of the six men who played cricket for Nottinghamshire but made the ultimate sacrifice in the War. The design is by Martin Somerville. Born 24th May 1891 in Warwickshire but moved to Nottinghamshire and was educated at Nottingham High School and Oundle. Qualified lawyer. A right-handed batsman and right-arm fast-medium bowler, he played briefly for Warwickshire then eleven times for Nottinghamshire in 1912. At the outbreak of war, he joined the Lincolnshire Regiment but in early 1915 he was commissioned into the Notts and Derby Regiment (Sherwood Foresters) before transferring to the West Yorkshire Regiment. Promoted to captain and sent France in February 1916 but killed in action on 10th May 1916 at the age of 24. He is buried at St Vaast Military cemetery, Pas de Calais. Born 15th December 1877 near Macclesfield, the youngest of ten brothers. Attended Rugby School before becoming an architect in Nottingham. A right-handed batsman, he played thirty matches for Notts between 1903 and 1905. In August 1905 he opened the batting with George Gunn against the South Africans and scored 85. In his last match for the Gentlemen of the South he took the catch of WG Grace. Ill-health forced him to give up cricket at the age of 27; nevertheless, he became a second lieutenant in the Notts and Derby Regiment in 1914. Sent to France in June 1915 and wounded in September, he was killed on 15th October 1915 aged 37. His body was never recovered but he is commemorated on the Loos Memorial, Lille. Born on 22nd January 1886 in Mansfield Woodhouse, the fifth of seven sons. Won Blues for rugby and lacrosse at Oxford and played twice for England at Rugby. After studying at the Sorbonne, he became a school teacher. He played three matches for Notts in 1911 and 1912. In 1914 he joined the Monmouthshire Regiment and was sent to France in February 1915.In May he was seriously wounded but recovered in England, then returned to his battalion. Now a captain, he was transferred to the South Lancashire Regiment and Mentioned in Dispatches twice. Killed on 22nd March 1918, aged 32, whilst helping a junior officer to escape. His body was later recovered, and he is commemorated in Roye New Cemetery, Somme. Born 6th June 1875 in County Cork but came to England as a boy. Initially a professional cricketer of Rye CC the came to Nottingham in 1900. A right-handed batsman and right-arm medium bowler. He played for Notts against the West Indies in July 1900 and in seven County Championship matches in 1900 and 1901. Between 1902 and 1904 he was a professional for Darlington CC. Charles enlisted as a private in the Notts and Derby Regiment (Sherwood Foresters) but was soon promoted to sergeant. He arrived in France in April 1916 and survived until 13th September 1917 when he was killed by a shell whilst standing next to his CO in Flanders. They are buried side by side at La Clytte Cemetery, Belgium. He was 42 years old. Born 11th August 1888 at Newstead Colliery Village. Began working in the local coal mine at the age of 12. Played for Newstead Colliery CC. A slow-medium left-arm bowler, he played seventy-eight first-class matches between May 1909 and July 1913, plus two more for Notts. in August 1914. He took 235 wickets at an average of 23.39, but is perhaps remembered as the non-striking batsman when Ted Alletson scored a record 34 runs against Sussex in 1911. William joined the Royal Garrison Artillery in February 1916 and served with the 13rd Siege Battery as a gunner. Went to France in May 1916 and was killed by a shell splinter on 9th August, two days before his 29th birthday. He is buried at Coxyde Military Cemetery, West-Vlaanderen, Belgium. Born 21st November 1870 at Staunton Hall, Nottinghamshire and educated at Bromsgrove School and Cambridge University, where he was awarded a Blue at Rugby. Became a curate, serving Pleasley Hill and Plumtree; also chaplain to Notts. County Asylum and rector of Broughton Sulney from 1907 to 1911. A right-handed batsman, he played sixteen first-class matches for Notts between May 1903 and July 1905, including the defeat by the Gentlemen of Philadelphia. In 1910 he went to India as a missionary, becoming the chaplain at Nagpur. During the War he served in Mesopotamia as a Chaplain 4th Class in the Army Chaplains’ Department. He died of a fever in Arzizieh on 14th January 1918 and is commemorated in a grave at North Gate War Cemetery, Baghdad. Several Notts cricketers served and survived, including Arthur Carr, George Gunn, Vincent Cartwright and William Barber. At the start of the war the two Pavilions, i.e. the present building and the Ladies’ Pavilion where the Hound Road stand is today, were handed to the military authorities. The Pavilion VAD Hospital was established, staffed mainly by female volunteers and funded by donations. It expanded from 36 beds into a 200-bed convalescent facility, which was one of the UK’s best-equipped physiotherapy and orthopaedic units. Between October 1914 and March 1919, when it officially closed, the hospital treated 3,533 patients, but some wards were still open when the County Championship resumed in 1919. Throughout the war years the pitch itself was used for various events. In 1915 a cricket match took place between the City Police and the Special Constables; in 1916 to Radford, Basford and District Athletic and Cycling Club held races; in July 1917 there was a sports carnival including a lady munitions workers’ Donkey Derby; in May 1918 a crowd of 4,000 watched a cricket match followed by a concert and three months later more concerts were included in a Fete in aid of the Patriotic Fair. Between April and September 1918 five baseball matches were played by American soldiers from military camps in the area. Thorotonians who went on the excursion to Broughton Castle this year will be interested in the recently published find of a large Roman villa on the Broughton estate. The land is owned by Martin Fiennes, the heir of Baron Saye and Sele. Apparently, in 1963, the local tenant farmer had discovered a burial containing the skeleton of a high-status woman, when he hit and damaged her sarcophagus with his plough and subsequently retrieved a human bone. A local historian and metal detectorist, Keith Westcott, heard this story and did a field-walk over the site, discovering a piece of Roman hypocaust tile. In April of this year, Oxford Archaeology carried out a trial dig at the site. They recovered various artefacts, including a Roman coin with a depiction of Romulus and Remus being suckled by the she-wolf. Samian pottery was found and also the tusk of a boar. The villa is described as ‘huge’. A geophysical survey indicate that it was not far short of the dimensions of Buckingham Palace! The site lies at the head of a triangle between the Fosse Way, Akeman Street and Watling Street, so is a very important Roman area. "A more exhilarating scene was probably never exhibited in the town of Mansfield, than was occasioned by opening the new Railway from the Cromford Canal... The morning was ushered in with the ringing of bells and a bonfire was made in the market place. About one o’clock the proprietors and friends of the undertaking began to assemble at the Swan Inn, and about two o’clock they proceeded on horseback attended by hundreds of foot people, along the Alfreton Road, about a mile and a half, to where it comes into contact with the Railway, at the beautiful five-arch bridge, constructed under the direction of Mr Jessop, the Engineer, where they met ten waggons laden with coal, from the Pinxton Colliery, surmounted by workmen and colliers, carrying branches of laurel. There the assemblage amounted to some thousands, covering not only the road, but in great measure the fields by the roadside. Kings Mill Viaduct carried the Mansfield and Pinxton Railway across a small stream. After many years of debate, from the 1790s, of how to connect Mansfield to the growing network of canals it was finally decided to make that connection via rail to the Cromford Canal at Pinxton, rather than constructing an additional canal. Work commenced on the rail in 1817 and concluded in 1819, when it opened for business on Easter Tuesday. Initially it was used to transport heavy goods, such as coal into Mansfield and stone, sand and malt out of the town. As the years went by, passenger travel was introduced and in 1849 the Mansfield & Pinxton line, which had recently been purchased by the Midland Railway Company, upgraded and extended into Nottingham, where it joined the main network. At this point steam locomotives were introduced on to this upgraded line and continued to transport goods and passengers until they were superseded by diesel power. However, during the mid-1960s the passenger services were withdrawn but coal and other goods continued to be transported. Fortunately, as the commercial side of transportation started to decline after the closure of many local collieries in the 1980s & 90s, the passenger service was re-introduced as the Robin Hood Line. This continued use of the train line makes it one of the oldest continuously running lines in the United Kingdom and possibly the oldest in England; some railway historians believe it to be the sixth oldest in the world. The original line was enabled by the construction of a viaduct (the “beautiful five-arched bridge” mentioned above), which is still standing and accessed by the public daily and is recognised as the oldest railway viaduct in the country. The construction of the rails, showing the method of anchorage and the fish-belly shape of each rail. The waggons of the Mansfield & Pinxton Railway were pulled by horses, though some accounts also refer to bullocks and oxen. The waggons are likely to have resembled those used on the Belvoir Castle Railway which opened 2 years earlier. The individual rails were only a yard long and were not laid on sleepers but fixed by a nail driven into a wooden plug in stone blocks placed in line with the rails. The rails were made of cast iron in a “fish-bellied” shape to provide extra strength. It is reported that horses pulled the waggons up to Kirkby Summit, “whence they came down of their own weight to Mansfield”. What we lack, tantalisingly, is any account of the braking system or how the horses were then deployed. Only goods were originally transported. 1832 saw the introduction of a passenger coach each Thursday. The estimated building cost was £22,800. The major subscribers were the Duke of Portland and Richard Arkwright who each contributed £5,000. In 2017 the Kirkby & District Archaeological Group (KDAG) shifted its focus from a vanished medieval house (the lost manor of Kirkby Hardwick) to a dramatically different theme: a still visible, local achievement of the Industrial Revolution. The Mansfield & Pinxton Railway is not widely known about, even locally, but the imminent 200th anniversary of its opening was seen to provide an ideal opportunity to celebrate its special claims to historical importance. The Steering Group brought together heritage groups from all parts of the railway (Old Mansfield Society; Sutton Heritage Society; Pinxton & S. Normanton History Society, as well as KDAG) along with several knowledgeable railway enthusiasts, under the chairmanship of Denis Hill, who was for many years Heritage Officer at Ashfield District Council. The Heritage Lottery Fund application was submitted in May 2018, and we learnt in late July that we had been successful. The HLF had made a grant of £89,600 to fulfil a detailed Project Plan. A major focus of the project is the actual anniversary date: Saturday, April 13, 2019. We are hoping to incorporate several aspects of the original opening, as described above: the procession, the flags, the church bells, the feasting, the entertainment - though the bonfire in the Market Square may be rather less achievable. More modern features of the celebration will include memorabilia (mugs, pens, etc), talks, and walks along the railway route, interaction with schools, a travelling exhibition in Mansfield Museum (February 2019) and other venues, and the creation of models and a video. The project has a two-year timescale and some aspects, such as researching the history and installing interpretation boards, will extend well beyond the anniversary date. We have appointed a Project Officer (Denis Hill) who will oversee the project from start to finish, but the detailed work on the various aspects of the celebration will be in the hands of working groups. Recruitment is underway! Many different skills are needed in terms of organising, writing, mapping, researching, designing, oral history recording, publicity and creative ideas. We would welcome anyone who is interested in contributing. Training can be provided in a number of these areas. It is evident from the opening paragraphs that the arrival of the railway created massive crowds and enthusiasm. Even if you can’t be part of the planning we hope you will note Saturday, April 13, 2019 in your diary and join in the celebrations which will be well publicised nearer the time. Beth lived to be 90 years old, yet her energy, curiosity and empathy were limitless. Born 1928, Beth grew up in Protestant Belfast but her two GP parents always employed Catholics and made sure Beth and her sister Joan were taken to school through the Catholic areas to appreciate how hard life was for some. This led Beth ultimately to become a Social Worker in the Probation Service and then a Magistrate. Her life in war-torn Belfast has been documented and is now held by The Imperial War Museum. She travelled widely with her husband Professor Brian Tate and was interested in historic buildings, music, poetry and politics. A fierce royalist and member of the Anglican church she also supported Jeremy Corbyn’s maxim, “For the many, not the few”. In her last year she found time to host an Irish Halloween party to raise money for the street children of Sierra Leone and her house was used by the BBC to film “Jamie Johnson Plays Football.” The weekend she died Beth had been due to fly to Belfast to feature in a film about her beloved uncle, C.S. Lewis. Sadly, she didn’t make it.